I am reading a truly great book by Larry Kane…the newsman who traveled with the Beatles on their ’64 and ’65 American tours. He later became quite close to John Lennon and stays friendly with Paul and Ringo even today. I had seen his interviews with The Beatles on TV as a teenager so may times that I recognized his voice in the next room! I always had a great admiration and received immense pleasure from Larry’s previous books….TICKET TO RIDE and LENNON REVEALED. His narrative skills make it an easy and comfortable read while putting you right into the action of those exciting times so long ago. Mr. Kane has the knack of making you feel like you were at those early shows…that you were on the plane flying city to city…that you knew what they were experiencing on their whirlwind tour schedule. So when I heard a new volume was forthcoming I investigated and received the book. The new book is entitled ” WHEN THEY WERE BOYS…the True Story of The Beatles Rise to the Top”. It is a magnificent recounting of the early days and nights of the six young men involved early on…John, Paul George, Stu, Pete and Ringo….their family members…girlfriends and school and musical mates. Some of the anecdotes are familiar but many are different and illuminating and were brought to my attention for the first time. Having followed The Beatles for nearly 50 years, it was great to read a new release that brings so many new and interesting points to life. Larry Kane has done it again with this book and I enthusiastically recommend that anyone interested in The Beatles…life long fans or newbies, get a hold of this great work. The book provides interviews with their earliest managers, supporters, fans and club owners. It gives you their stories…stories generally not heard. Their opinions, their memories and their critiques of The Beatles as very young men are fascinating. It’s always a great experience to learn interesting facts and anecdotes that came from associates BEFORE the worldwide fame and acclaim. In the book Larry kane does just that…feed you a steady stream of “great stuff”, about the who what and when of the early days of The Beatles and their cohorts. If you are a BEATLE FAN…this book is a MUST READ ! 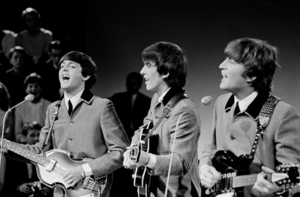 This entry was posted in Music, Pop culture, The Beatles, Uncategorized and tagged Beatle, John Lennon, Kane, Larry Kane, Paul George, Pete, Ringo Starr, United States. Bookmark the permalink. if you haven’t read TICKET TO RIDE, that is an interesting book as well. Larry was on the American Tours in ’64 and ’65 and he got a lot of exclusive interviews and access to the lads. There’s a lot of great stuff in his books.